Sitting on it's original farm site, for about 170 years...it had been moved from its original foundation, to the back yard in 1937, where it sat , quietly, fading away into oblivion.. A new, bigger and more modern home had replaced it, understandably. It now served as a storage shed and a sometimes play house for future generations of the Lyle children, and thankfully, the roof was somewhat maintained, as any old house lover will agree, water is the worst villain. 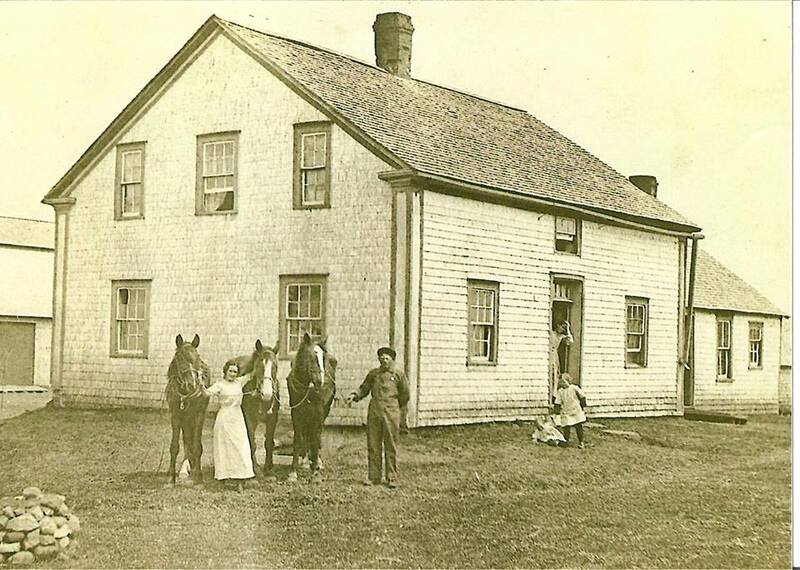 We returned to PEI in 2004, having purchased a late Victorian house in Birch Hill. Needing insurance of course, a date was set with the agent, Jane MacLaurin to come by. In passing she said, "So, you like old houses I gather?" I replied that yes we did , to which Jane said, "You'd probably like the old place at my grandmother's property".. Curious to see what she was talking about, I soon found myself seeking out Mrs Helen Lyle in Central Lot 16. The rest of this story is as they say, history. 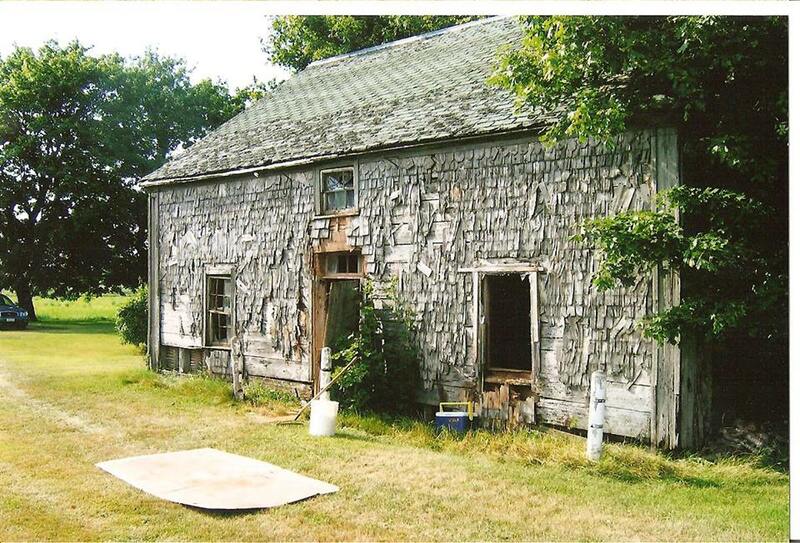 Helen Lyle greeted me at her door and after a few exchanges, agreed to show me through the old homestead, out back. In pretty rough shape on the exterior, what I found was a true early PEI interior, virtually unchanged since about 1863, when the centre chimney was replaced with modern stoves... I learned from Helen, that the kitchen wing had been moved off the property to nearby, Miscouche, when the house was hauled off its foundation, and is today standing , but she was not certain exactly where. The minute I entered the Lyle house, I was smitten... totally smitten. This was no Anne of Green Gables Victorian era farmhouse.... this house had a simplicity and purity and elegance I had never seen on PEI. The mouldings , the fireplace mantelpiece, the 6 panel doors, the chair rails in place and the beaded pine sheathing upstairs!!! Oh, that upstairs room....... I will never forget the first time I saw that upstairs room! Country Classical.... I was awestruck. period. Having had some previous experience, back in Ontario, I knew this house was a virtually intact interior, with a very quickly failing exterior and time was of the essence here... This house needed to be rescued and NOW. Squirrels and raccoons and pidgeons had made their home in it and who knows whatever else! The roof had been patched many times but was in rough shape. Two wild maple trees had taken root at two corners and had caused a lot of rot by their debris over the years. At first, the house wasn't available, but a year later, I paid another visit, as I was NOT ABLE TO STOP THINKING ABOUT IT, Things had changed at the Lyle home, and decisions were being made that in the end resulted in ..
"It's a marvel that the Lyle House is still in use." February 16 - The Minister Responsible for Culture, Hon. 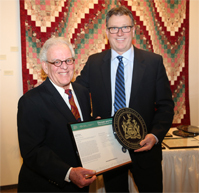 Doug Currie, presented Claude with a plaque awarding the Lyle House as a Designated Heritage Place.